The island of Tasmania, at the southeast tip of Australia, is an ideal natural laboratory for ambient noise tomography, as the surrounding oceans provide an energetic and relatively even distribution of noise sources. We extract Rayleigh wave dispersion curves from the continuous records of 104 stations with similar to 15 km separation. Unlike most passive experiments of this type, which observe very little coherent noise below a 5 s period, we clearly detect energy at periods as short as 1 s, thanks largely to the close proximity of oceanic microseisms on all sides. The main structural elements of the eastern and northern Tasmanian crust are revealed by inverting the dispersion curves (between 1 and 12 s period) for both group and phase velocity maps. Of particular significance is a pronounced band of low velocity, observed across all periods, that underlies the Tamar River Valley and continues south until dissipating in southeast Tasmania. 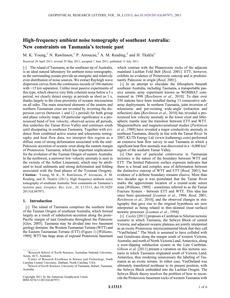 Together with evidence from combined active source and teleseismic tomography and heat flow data, we interpret this region as a diffuse zone of strong deformation associated with the mid-Paleozoic accretion of oceanic crust along the eastern margin of Proterozoic Tasmania, which has important implications for the evolution of the Tasman Orogen of eastern Australia. In the northwest, a narrower low-velocity anomaly is seen in the vicinity of the Arthur Lineament, which may be attributed to local sediments and strong deformation and folding associated with the final phases of the Tyennan Orogeny.